ISLAM / Where are the moderate Muslims speaking out? If you ignore anything said by a Muslim then you probably have heard nada, zip, zilch. Last week the highest cleric in Egypt, the Grand Mufti, unconditionally condemned ISIS and extremism. On September 10th, the American Muslim community held a press conference that strongly condemned extremists, and specifically ISIS. They also pledged their love and respect for the American ideal … being an ideal for all. (NextGov) The ‘USA Freedom Act’, originally introduced by Rep. Jim Sensenbrenner last year, would end the government’s ability to collect bulk metadata of phone records and usher in a series of new privacy and transparency measures designed to prevent abuses at the nation’s intelligence agencies. It would bar the government from retaining metadata—the numbers and time stamps of calls but not their actual content—and instead require phone companies to keep those records, which would be given to intelligence agencies after the government earned approval for data searches from the Foreign Intelligence Surveillance Court. Read full story. So does this mean that they found a loophole? 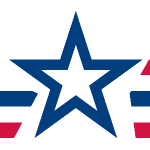 Purpose: To rein in the dragnet collection of data by the National Security Agency (NSA) and other government agencies, increase transparency of the Foreign Intelligence Surveillance Court (FISC), provide businesses the ability to release information regarding FISA requests, and create an independent constitutional advocate to argue cases before the FISC. • The USA Freedom Act ends bulk collection under Section 215 of the Patriot Act. • The bill would strengthen the prohibition on “reverse targeting” of Americans—that is, targeting a foreigner with the goal of obtaining communications involving an American. • The bill requires the government to more aggressively filter and discard information about Americans accidentally collected through PRISM and related programs. • The USA Freedom Act creates an Office of the Special Advocate (OSA) tasked with promoting privacy interests before the FISA court’s closed proceedings. The OSA will have the authority to appeal decisions of the FISA court. • The bill creates new and more robust reporting requirements to ensure that Congress is aware of actions by the FISC and intelligence community as a whole. • The bill would grant the Privacy and Civil Liberties Oversight Board subpoena authority to investigate issues related to privacy and national security. • The USA Freedom Act would end secret laws by requiring the Attorney General to publicly disclose all FISC decisions issued after July 10, 2003 that contain a significant construction or interpretation of law. • Under the bill, Internet and telecom companies would be allowed to publicly report an estimate of (1) the number of FISA orders and national security letters received, (2) the number of such orders and letters complied with, and (3) the number of users or accounts on whom information was demanded under the orders and letters. • The bill would require the government to make annual or semiannual public reports estimating the total number of individuals and U.S. persons that were subject to FISA orders authorizing electronic surveillance, pen/trap devices, and access to business records. • The USA Freedom Act adopts a single standard for Section 215 and NSL protection to ensure the Administration doesn’t use different authorities to support bulk collection. It also adds a sunset date to NSLs requiring that Congress reauthorize the government’s authority thereby ensuring proper congressional review. Adam Smith, author of The Wealth of Nations, is widely regarded as the father of capitalism, as well as a strong influence on the founding fathers of the United States. He believed in a war tax and once said that the willingness of citizens to be taxed is the greatest test of public support for war. I agree with such a philosophy. In a time of record deficits and debt, everything must be on the table in terms of cuts. But with a sluggish economy, we do need to raise revenues. Some 50% of Americans pay little or no income taxes. This must change. But could we have a more democratic tax system–for semantics I mean one based on political opinion at the individual level? So, lets up it to $1100 each. That way we’d have a few billion extra to help with making sure the troops were well protected, or to pay off various war debts we have. I’m against our continued involvement, but if I was rich, I’d make the donation for fiscal sanity’s sake! I’m guessing not all of these pro-war people are wealthy. Since its 1/3 of Americans, let’s assume a normal distribution meaning a per capita income of around $47,000. That $1100 tax would hit pretty hard at your pocketbook on such an income. My father makes more than that and he feels the difference in such a tax hike or cut. The Dems want tax hikes, but only on the “rich”. I say instead hike taxes with a fee-for-service concept. If you support the war, you pay an extra $1100 regardless of income. If you don’t want the government to cut your entitlement programs, be prepared to pay more money! Somebody else can do the math on those and then get back to you! I bet when faced with such tax hikes, that 1/3 of Americans would start to shift toward opposing the war and all those people saying “don’t touch my [insert imperial federal government program here]” would start to reconsider the benefits of those programs vs. the cost. Americans lately seem pretty opposed to the national debt and like to call for cuts, until it touches something that personally affects them. There should be no sacred cows! Bill4DogCatcher welcomes guest blogs on items of interest to the dogs in our community. Your blog item should be thoughtful and facts should have a basis. Appearance on Bill4DogCatcher.com does not represent an endorsement of either the idea or the content — but obviously I find your thought or thesis interesting or it wouldn’t be appearing. DUE TO COPYRIGHT issues: I really need your permission to publish a specific item on Bill4DogCatcher. If you are interested in sharing your thoughts please send an email to Bill@Bill4DogCatcher.com and send your item or tell me that I have permission to include a specific article from your blog, etc. ignore those values when we want a predetermined outcome. against them other than wrong place at the wrong time. Much has been made of who is financing the building of the mosque that is not really a mosque just blocks from Ground Zero in New York City. The Cordoba House, as the mosque that is not a mosque is called, is estimated to cost $100,000,000 — none of it coming from U.S. government, state or local governments. And so far none of the funding for the building of Cordoba House has been raised either. But what if I told you that there is a church just blocks away from the Cordoba House that is being built with taxpayer money at the cost of $60,000,000 or approximately $857,142 per family that attends the church (1). The church is St. Nicolas, a Greek Orthodox church. The blogosphere is alive with how New York’s government is favoring Cordoba House but bureaucratically blocking the rebuilding of ‘a Christian church’ damaged in 9/11. Most stories do not even give the name of the church and offer even fewer details as to how the rebuilding of this Christian church is being bureaucratically blocked by New York. If you visit the church’s website you will find that they are still collecting money for their own rebuilding of the current church and there is no complaint about any roadblocks being imposed by New York. 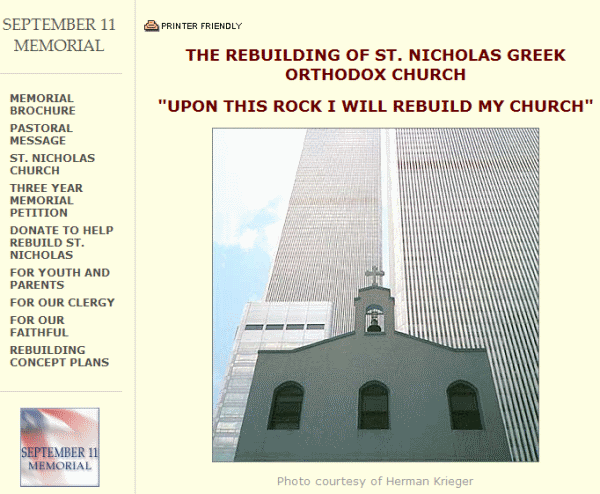 There has been a general design plan for the rebuilding of St. Nicolas, but that is part of the Twin Towers and included within the 9/11 Memorial Funding. The construction is part of a campus concept; change in one part of the design affects other parts. View rebuilding of the Twin Towers via live webcam. St. Nicolas appears to be open only for weekend services and is not otherwise a functioning church offering other regularly scheduled services and community activities. Some speculation and controversy exists that Cordoba House may accept some foreign funding, yet there seems to be no concern expressed that St. Nicolas has accepted foreign government funding (Greece) to rebuild and to repair the original church; Greek government funding is documented on St. Nicolas’ website. 2004: New York Governor Pataki pledged to rebuild St. Nicolas which was partially destroyed on 9/11 by terrorist attacks on the Twin Towers. The funding is to be part of the 9/11 Memorial on the campus of the new Twin Towers. 2004-2008: As planning progresses, the city of New York formally offered to spend up to $60,000,000 of taxpayer money as part of the 9/11 memorial funding. $20M was for the church and $40M was to build unique protections for the church should the new twin towers be bombed again. 2009: The deal was still a go in March of 2009 — with the church getting $20 million of taxpayer money up front. 2010: The deal went bad in March 2010 when St. Nicolas appears to have decided that what it really wanted to do was to move to a new location, and to rebuild using taxpayer money. 2010: Fox News reported in mid-August 2010 that the church rejected New York’s offer of $60 million taxpayer dollars to rebuild where it is, instead of paying for a new church to be built elsewhere. Throughout most of the blogosphere, and even in most traditional media reporting, almost none of the above is offered in discussion. 1- There are approximately 70 families that belong to St. Nicolas which mathematically works out to $857,142.85 ($60M / 70 families). Bill4DogCatcher sez: The original version of this letter can be found here. While I may not agree with everything, the points made in this letter are largely and overwhelmingly valid criticism of the state of American conservatism in 2010. Your party — the GOP — and the conservative end of the American political spectrum have become irresponsible and irrational. Worse, it’s tolerating, promoting and celebrating prejudice and hatred. Let me provide some examples — by no means an exhaustive list — of where the Right as gotten itself stuck in a swamp of hypocrisy, hyperbole, historical inaccuracy and hatred. You can’t flip out — and threaten impeachment – when Dems use a parliamentary procedure (deem and pass) that you used repeatedly (more than 35 times in just one session and more than 100 times in all! ), that’s centuries old and which the courts have supported. Especially when your leaders admit it all. You can’t rail against the bank bailouts when you supported them as they were happening. You can’t be for immigration reform, then against it . You can’t flip out when the black president bows to foreign dignitaries, as appropriate for their culture, when you were silent when the white presidents did the same. Bush. Nixon. Ike. You didn’t even make a peep when Bush held hands and kissed leaders of countries that are not on “kissing terms” with the US. You can’t condemn blaming the Republican president for an attempted terror attack on his watch, then blame the Dem president for an attempted terror attack on his. You can’t mount a boycott against singers who say they’re ashamed of the president for starting a war, but remain silent when another singer says he’s ashamed of the president and falsely calls him a Maoist who makes him want to throw up and says he ought to be in jail. You can’t condemn criticizing the president when US troops are in harms way, then attack the president when US troops are in harms way , the only difference being the president’s party affiliation (and, by the way, armed conflict does NOT remove our right and our duty as Americans to speak up). You can’t call a reconciliation out of bounds when you used it repeatedly. You can’t spend taxpayer money on ads against spending taxpayer money. You can’t condemn individual health insurance mandates in a Dem bill, when the mandates were your idea. advocate a traitorous act like secession, violent revolution , military coup or civil war (just so we’re clear: sedition is a bad thing). incite insurrection telling people to get their guns ready for a “bloody battle” with the president of the United States. So, dear conservatives, get to work. Drain the swamp of the conspiracy nuts, the bald-faced liars undeterred by demonstrable facts, the overt hypocrisy and the hatred. Then offer us a calm, responsible, grownup agenda based on your values and your vision for America. We may or may not agree with your values and vision, but we’ll certainly welcome you back to the American mainstream with open arms. We need you.